Rocky Glaciers: Will Everest's glaciers disappear by 2100? Will Everest's glaciers disappear by 2100? This article was prepared by PhD students Scott Watson and Owen King with suggestions from Dr. Ann Rowan. Their research projects study the processes that control the behaviour of glaciers in the Everest region of Nepal, and measure how these glaciers change over time. We were surprised to read yesterday that ‘about 5,500 glaciers could disappear or drastically retreat by the end of the century…’ – The Guardian. While it may seem obvious that climate change will ultimately lead to the demise of Himalayan glaciers, 2100 seems awful soon! The research published in The Cryosphere is a modelling study showing the sensitivity of glaciers in the Everest region to climate change. It represents a step forward in the application of such glacier models and incorporation of the current process-based understanding of Himalayan glaciers, but as stated by the authors is not without uncertainty. Although providing a first look at the possible sensitivity to climate change of glaciers in the Everest region, this paper also shows that glaciologists still have some way to go, both in terms of building models that represent the processes that cause these mountain glaciers to change, and in collecting field data to calibrate and validate their models. Some major limitations with this paper are discussed during this process and indeed in the paper itself, but this uncertainty does not necessarily translate into the media headlines. 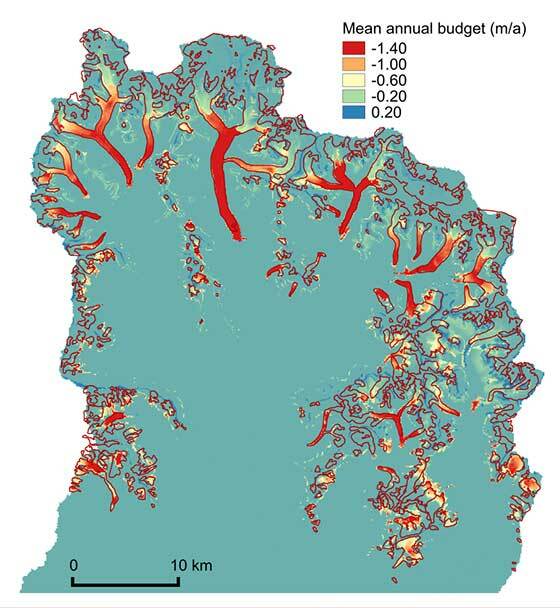 Similarly the modelling process cannot account for key aspects of the current understanding of the behaviour of large debris-covered glaciers (see below), such as the ones shown to disappear by 2100 in a widely publicised GIF animation. Models will always include uncertainties, since they are by design a simplification of a reality which cannot be represented in its entirety. Greater simplifications are often justified for regional studies. The model results presented in the figure below from the paper by Shea and coauthors shows the majority of ice thickness loss (red) occurring at low elevation on glaciers in the Everest region. Compare this with the second figure from Bolch et al. 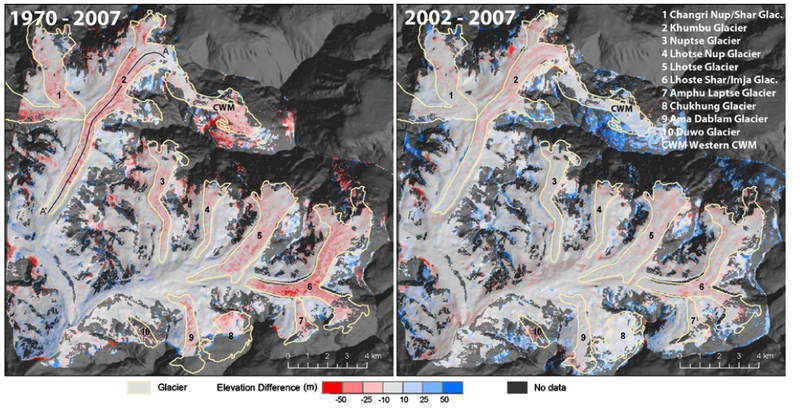 (2011), which shows the change in glacier surface height (indicating change in ice thickness) measured from satellite observations over a similar period to the model results (1970–2007). The ablation (melt) pattern shown above is known to occur on clean-ice glaciers since they response predominately to temperature (more melt at lower elevations), but thick rock debris cover towards the terminus of these glaciers insulates the ice below, meaning the majority of melt occurs higher up in the mid reaches of the ablation zone of these low gradient glaciers where the debris-cover is thinner (e.g. Bolch et al., 2011; Benn et al., 2012). The model calibration (1961 - 2007) overestimates the magnitude and spatial distribution glacier ablation (melt). For example, between 1970 - 2007, Bolch et al. (2011) show between 25 - 50 m of total elevation (ice thickness) loss across the Khumbu Glacier, or ~0.67 - 1.35 m per year. This loss is essentially zero at the terminus (see figure below), whereas a figure reported in this recent study (shown above) shows a maximum modelled elevation (ice thickness) loss of ~ 1.4 m per year, which is over twice the rate of surface lowering measured from satellite observations. While the model represents valuable progress in the field of glacier modelling, it is published as a sensitivity study with large accompanying uncertainties, and therefore should be treated as such. Improved modelling studies are just around the corner: The authors acknowledge that ‘at this stage, due to computing time, a lack of knowledge about debris-covered dynamics or data for validation, we cannot address in details some of the reviewers’ comments but we are confident that it will be possible in the future’. These studies are therefore important to highlight model sensitivities and where more field data is required to validate and improve existing for future research. Making predictions of glacier change in Himalaya requires both improvements in existing glacier models to capture more of the processes important to the behaviour of mountain glaciers, and data from these glaciers to tell us how they are changing over time. After all, a model is only as strong as the data that it is validated with. Perhaps most importantly, the starting ice thickness (and hence volume) simulated by the model of the glaciers in the Everest region does not correlate well with what is presented in the literature. Such depth measurements are scarce but are available in some places. For example Gades et al. (2000) and Moribayashi (1978) show the ice thickness on the Khumbu glacier near the base of the icefall is over 400 m. However, the modelled ice volume at the same location is only 200 m as shown on the animation. It is therefore likely that the glaciers in this region have a notably larger ice volume than is represented in this model and would therefore take notably longer to disappear. There are other factors which can lead to rapid glacier recession such as glacial lake formation, and also factors that prolong the lifespan of glacier ice considerably, such as the surface layers of rock debris found on many large Himalayan glaciers that insulate them from warming air temperatures. These will not be addressed here since they are not incorporated into the modelling study, but would probably result in different predictions of glacier response to climate change. Interestingly in the response to reviewers comments dated 29 January 2015. The authors explicitly state that ‘…our results should not be considered as projections or predictions of future glacier change’, rather the study was a tool to explore possible glacier sensitivities to climate change. Overall the work of Shea et al., 2015 provides an important study into how the regions glaciers could respond to climatic warming. However, the headlines should perhaps treat more cautiously the results presented. There are certainly many things we don’t yet know about how glaciers in the Himalaya will change during the 21st Century! Benn, D.I. Bolch, T. Hands, K. Gulley, J. Luckman, A. Nicholson, L.I. Quincey, D. Thompson, S. Toumi, R. and Wiseman, S. 2012. Response of debris-covered glaciers in the Mount Everest region to recent warming, and implications for outburst flood hazards. Earth-Science Reviews. 114(1–2), pp.156-174. Bolch, T. Pieczonka, T. and Benn, D.I. 2011. Multi-decadal mass loss of glaciers in the Everest area (Nepal Himalaya) derived from stereo imagery. The Cryosphere. 5(2), pp.349-358. Gades, A. Conway, H. and Nereson, N. 2000. Radio echo-sounding through supraglacial debris on Lirung and Khumbu Glaciers, Nepal Himalayas. Quincey, D.J. Luckman, A. and Benn, D. 2009. Quantification of Everest region glacier velocities between 1992 and 2002, using satellite radar interferometry and feature tracking. Journal of Glaciology. 55(192), pp.596-606. Hi Scott and Owen - thanks for the post. With regards to ice depths, check Figure 18 in the paper. Median modelled ice thicknesses at the lowest elevations are over 200 m, with an upper quartile near 400 m thickness and maximum values up to 600 m. The colour scale in the animation was geared towards lower ice depths to better illustrate the potential changes. And with regards to the comparison between our modelled mass balance and the elevation changes you show above, the two are not directly comparable. Surface elevation changes area due to (a) mass balance changes, but also (b) emergence and submergence. Given an ideal set of mass balance observations and remotely sensed surface height changes, measured mass balance at the terminus will always be more negative than the surface height change because of emergence: the apparent height change is less negative because of glacier flow. Finally, as I've tried to stress in interviews, this model is a tool to examine how sensitive modelled glaciers might be to future change. Its also an important first step, as you acknowledge above. Better data sets (ice thicknesses, high altitude meteorology) and improved representations of the dynamics will help us reduce the uncertainties. The end result however, in a warming climate, will be reduced glacier volumes and extents. We'd be grateful for any other comments and suggestions, and happy to see what you and your groups are working on. Thank you for taking the time to respond. Yes it’s unfortunate that uncertainties are often buried in the media articles. They are arguably just as, or perhaps even more important that the headline results in these types of studies and should help justify the creation of larger datasets and field observations as you state...including more widely distributed ice depths for model validation. We would argue that given the zero or negligible flow across the lower ablation regions of many of these glaciers, that emergence would be negligible, hence elevation change is comparable to mass balance as reported by Bolch et al. (2011) and similar studies. Quincey et al. (2009) show 9 out of the 20 glaciers studied report no flow and another 3 report low flow in their lower ablation regions. For the Khumbu this was up to 4 km from the terminus. Though understandably there is uncertainty associated with these low values…yet more excuses for field campaigns. Overall we are very impressed with the depth of the study but were just a little concerned regarding the headline figures, as we wouldn’t expect this volume of ice loss before 2100. Hope all is well/ improving in Nepal. We are planning to head out this October so it would be great to meet at some stage.